13 left in stock, Hurry! Lovers of the original Hustle Butter formula can now enjoy the benefits of CBD oil. CBD oil, which is a non-psychoactive extract of hemp, adds to Hustle Butter’s soothing properties and helps prevent and treat irritation. Rich and creamy, this CBD-enriched formula maintains the mango, papaya, cocoa, shea, and other butters included in Richie Bulldog’s original Hustle Butter Deluxe formula. This Hustle Butter CBD Luxe is an excellent vegan alternative to petroleum-based products and can be used to lubricate tattoo sites before, during, and after procedures. When used before or during procedures, Hustle Butter CBD Luxe preserves stencils, doesn’t clog tubes, and allows all colors to go in effortlessly (including yellows and whites) for optimal results. 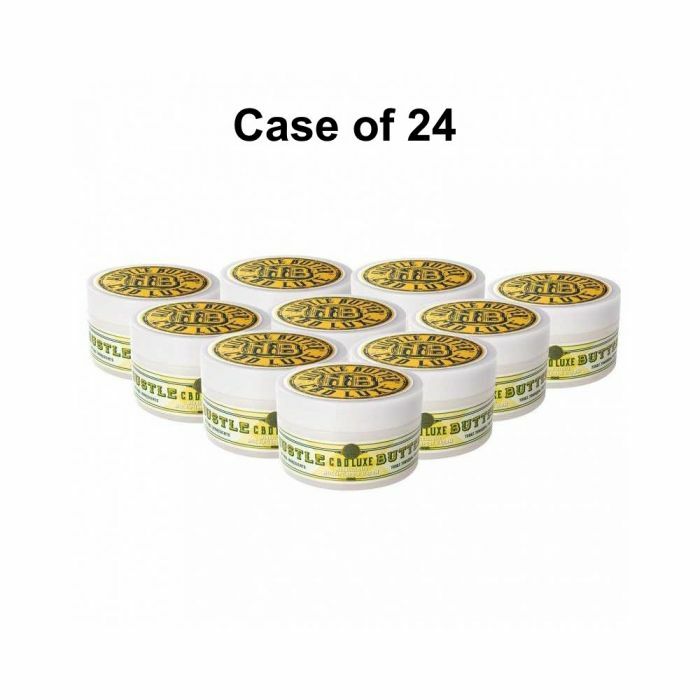 This listing is for one case of 24 5oz tub of Hustle Butter CBD Luxe. Stock up your shop or studio with this Richie Bulldog-certified, CBD-enriched professional tattoo care.